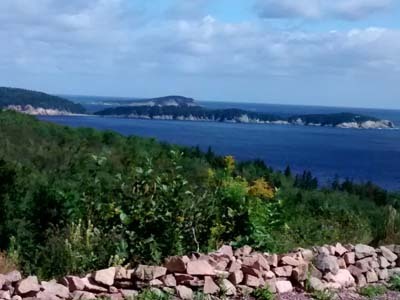 Cape Breton's cliffs are sheer and the island's roads tend to be winding with steep climbs and decents. But allow me to debunk the myth that any of this is "scary stuff" for either driver or passenger. It's not, really. 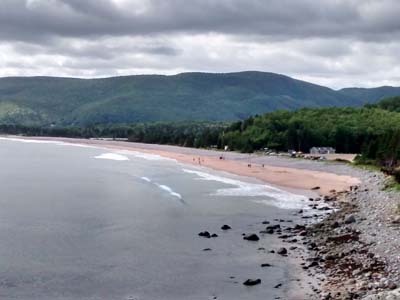 The Cabot Trail - Drive it Clockwise or Counter Clockwise? Truthfully, the decision of which direction to drive it makes very little difference. 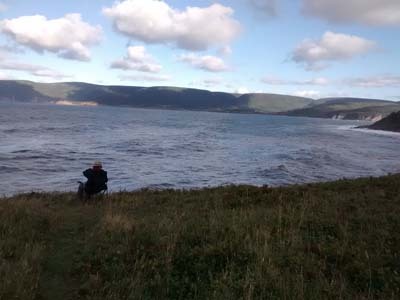 We had heard that it can be pretty scary to be on the "drop off" side of the highway but we decided to drive the Cabot Trail counter clockwise anyway. We wanted the better view and photo opportunities. Our drive is now finished and we have no idea at all what the fuss is about. There was never a point where there was not at least 10 feet of solid earth and often a sturdy barrier between the road and "the edge". Anyone who has driven roads in the American Southwest would surely laugh loud and long at the notion that this could be considered a frightening road for some. 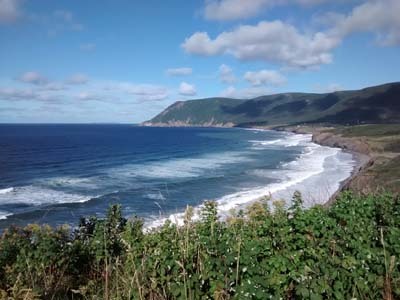 The Cabot Trail refers not to a hiking trail but a route: the road that winds around Cape Breton's very scenic highlands. 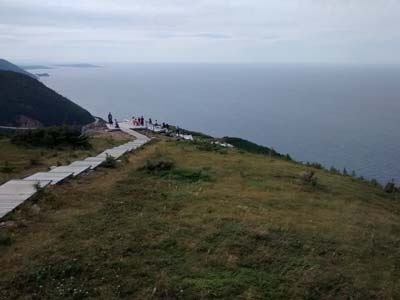 Cape Breton Highlands National Park takes up most of the interior of this loop and several unique communities border the park. 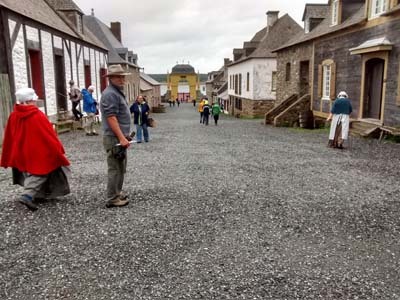 Many artists call this part of Nova Scotia home and countless galleries and cultural experiences are on offer. The Cabot Trail only appears to hug the edge. Really, it's no big deal. We're here too early in the season to appreciate the full effect. As beautiful as it is, imagine the scene when the leaves change and the island celebrates the annual Celtic Colors Festival. 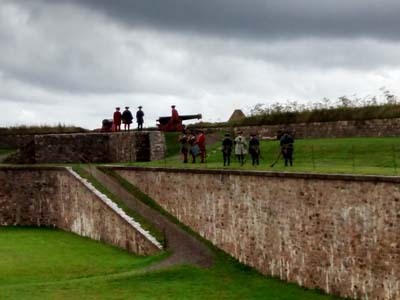 We only allowed four days to tour around Cape Breton on this trip. We've already vowed to come in October and spend much longer on a future trip. 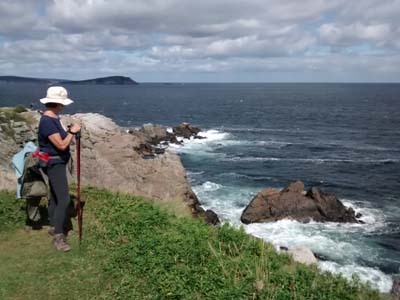 Cape Breton Highlands National Park boasts an extensive system of hiking trails. We chose two of the most popular. Middle Head and Skyline Trails, at opposite sides of the park so we could space them a day apart. 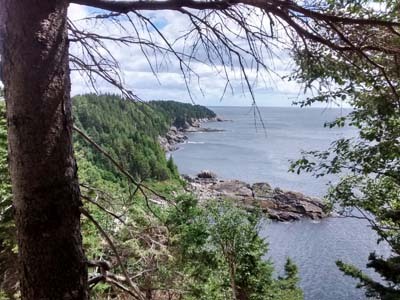 I have to admit we were slightly disappointed with our second hike: the Skyline Trail. I know it's only because of all the hype we'd heard and we'd allowed our anticipation to be built up a bit too high. 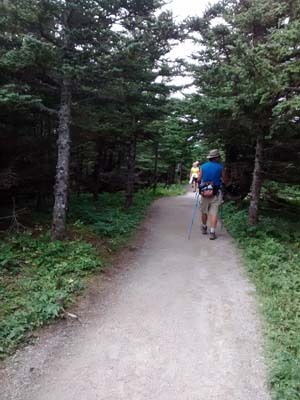 The trail starts out as a gravel road and narrows to become a totally smooth pathway, wide enough for wheelchairs, walking side-by-side, or easily passing the many other hikers you'll encounter. Although quite long, this makes the trail easy, but in our books, also quite boring. Until you get close to the terminus, there are no points of interest. The view at the end is, indeed, spectacular but, as someone pointed out, you could pretty much see the same from the road below. Of course hiking is a different experience than driving and it was perfect hiking weather. 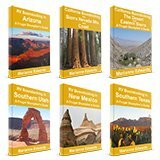 We extended the 4.7 mile hike to 5.7 miles by returning along a secondary trail which was more rugged and trail-like, and offered a few other viewpoints. The craziest part about this trail was that, at the end, just before reaching the view, the trail turns into a boardwalk with steps but no ramp. 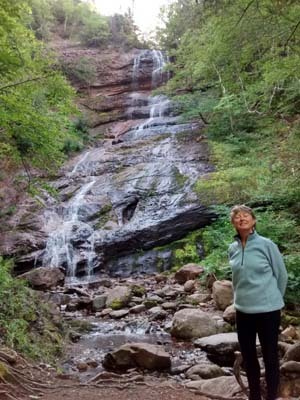 If you are going to the trouble to build more than 2 miles of accessible trail, you should at least let the person in the wheelchair reach the view, too, shouldn't you? These were easily accessible from the road. 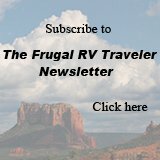 So far on this trip, we've drawn on various camping options and resources; we haven't really needed to rely on finding true boondocking sites. But there are no Boondockers Welcome or Harvest Host locations on Cape Breton and the few Days End listings we saw were no longer available. We had thought we might camp at Meat Cove. 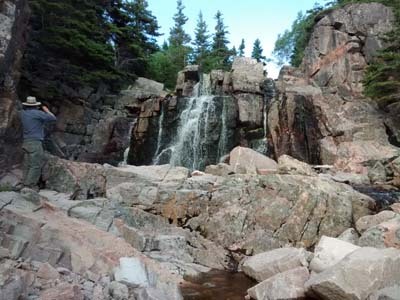 We'd heard good things about the campground here, in Cape Bretons's most northerly community and, literally, at the end of the road (which had also disintegrated to a very bumpy, rough, gravel and dirt surface.) We arrived late in the day and the campground had one available site. The view was spectacular but there was no way we could be level and we'd be parked almost on top of our neighbor. However, for just $34.00 that last campsite could be ours. We turned around and stopped about 2 miles down the road at a roadside pullout instead. There was no prohibitive signage. 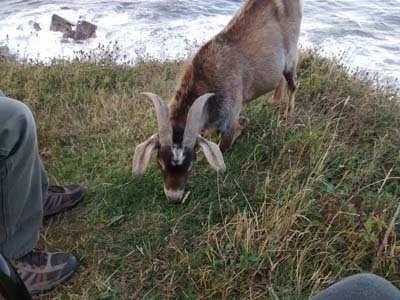 We settled in, pulled out lawnchairs and, as usual, we enjoyed a peaceful evening and slept without traffic or interruption - although we did have a surprise evening visitor. A surprise visitor. 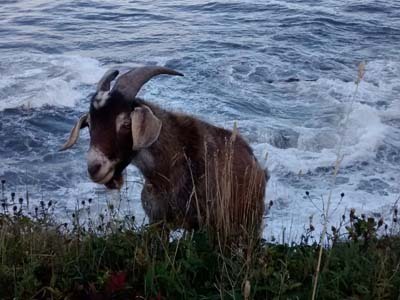 It was as if he climbed up out of the ocean. Our visitor was certainly not shy. The next night, we got a little braver. We pulled off to the the side of the road within view of a harbour and a few houses. We were just south of the village of Cheticamp. Again, there was no prohibitive signage and no one bothered us. When we told people we met later about this, they said, "Of course not. 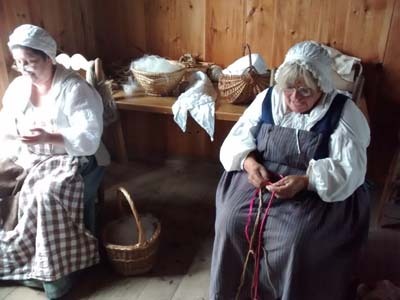 This is Cape Breton; no one will mind." The weather, although perfect while we drove the Cabot Trail, was not as good the other two days we were on the island. 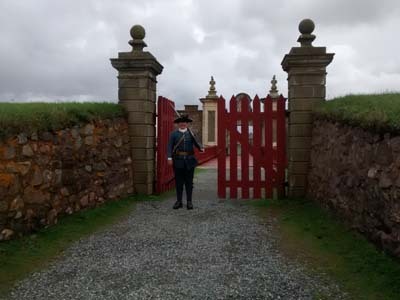 The Fortress of Louisburg National Historic Site near Sidney had been highly recommended and, as it turned out, much of it is indoors so it was a good choice on a rainy day. 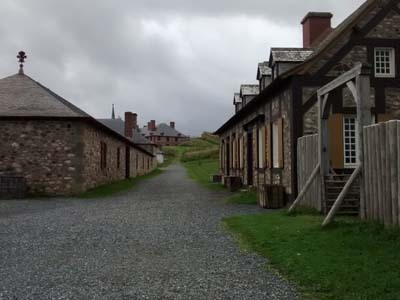 It is, by far, the best living history park we've ever visited anywhere. Very well done in every respect! 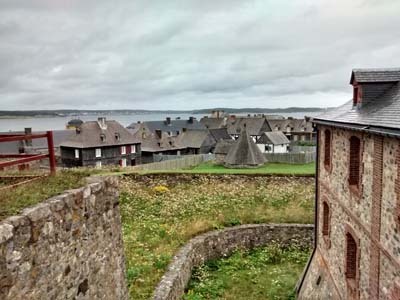 The fort was built to protect France's interest in this rich cod fishing area. Interrogated by guards before we can enter. 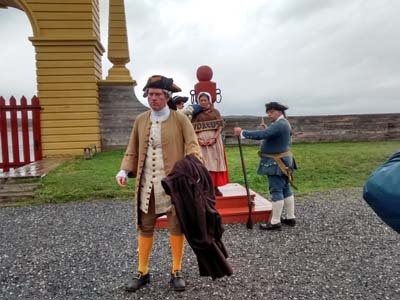 Reconstructed as it was in the 1700s. Many costumed characters in the streets and all the buildings. 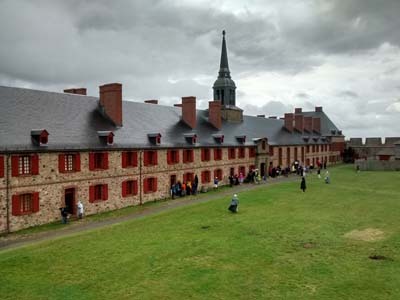 Our last day in Cape Breton was another rainy day. We had seen notices throughout PEI and Nova Scotia advertising dates and times for a ceilidh but we never managed to get to one. 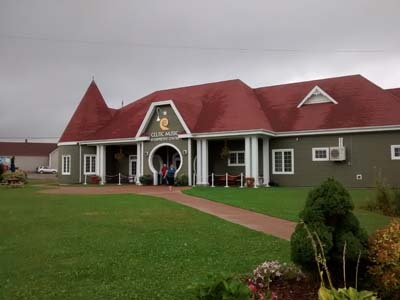 The Celtic Music Interpretive Center in Judique, advertised a lunch time ceilidh and was on today's route! 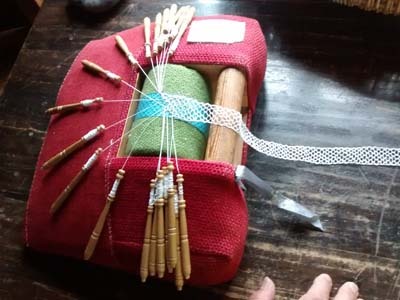 It sounded like the perfect way to spend a rainy afternoon. I have a brother-in-law who plays Irish music and we've attended a few ceilidhs near home. 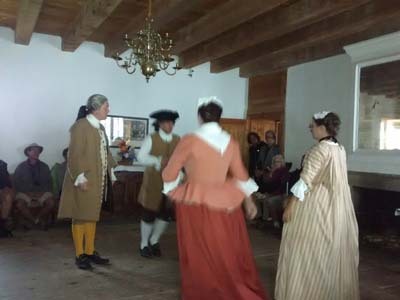 Although it's been a while, from what I recalled, dancers are arranged as four couples facing a square, a caller teaches the steps, and then calls them out to the beat of the music. We dance through several repetitions until the music stops. Then the process repeats with new steps for each song. But today we learned that a ceilidh is not, by definition, a dance. 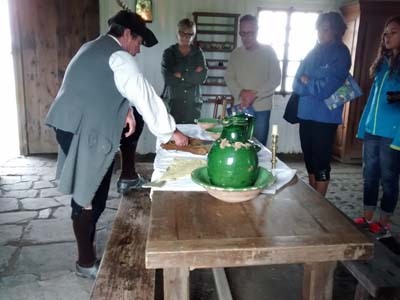 It just means "a gathering" - often informal, a kitchen party, it could include music or dancing or just story telling. Arriving at the Celtic Music Interpretive Center, we were seated in a restaurant where a very talented couple entertained us with Celtic tunes but there was no dance floor. It was very enjoyable but we realized we would have to get today's quota of steps in elsewhere! We accomplished some of that in the attached Celtic Music Museum. 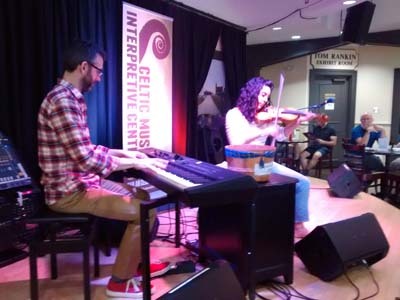 We came away with a new appreciation and a much greater understanding of the different tempos - jigs and reels and other variations in Celtic music. 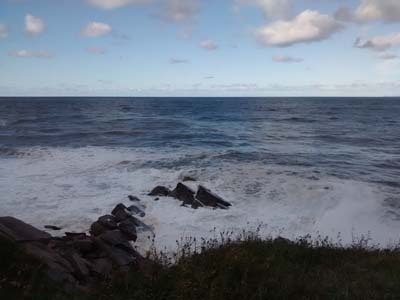 I was astonished to learn that almost every recognizable name in this genre - John Allan Cameron, Ashley MacIssac, the Barra Macneils, Rita MacNeil, and Natalie MacMaster, to name just a few, grew up in this same part of Cape Breton. No wonder it's known as The Celtic Coast! No dance but the music was fun! 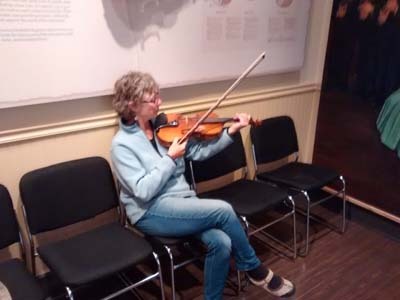 In the museum, we learned to step dance and play the fiddle. Yep, you guessed it. I'm a natural! 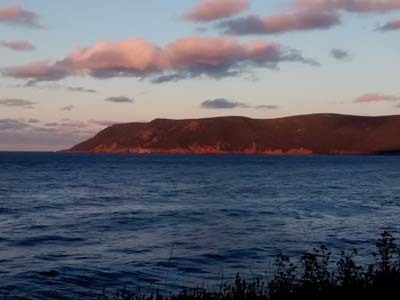 Spectacular fall colors, amazing music (and, hopefully, dancing) - plenty of reasons to return to Cape Breton. And next time, it will definitely be in October during the Celtic Colors Festival! Sheila and I have been enraptured with this beautiful trip, dear friends! Thanks for sharing with us.